The Data Protection Commissioner has asked the Department of Social Protection to outline how social welfare legislation, cited by the Department, provides a "robust legal basis" for the current roll out of the Public Services Card. In a statement, Helen Dixon said the issue of transparency needs to be addressed in relation to the Public Services Card. Ms Dixon said there is a pressing need for updated, clearer and more detailed information to be communicated to the public regarding the mandatory use of the card. Earlier, Minister for Social Protection Regina Doherty said up to 50 public bodies have access to the data identity set stored on Public Services Cards, according to legislation passed in 2013. 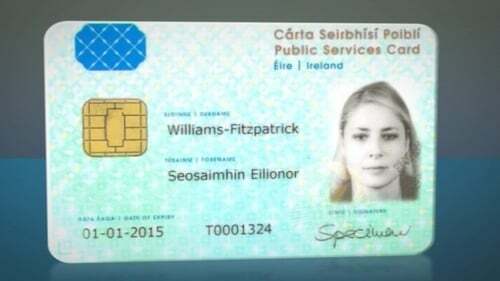 Ms Doherty said there are no plans to store any more information on Public Services Cards in the future. Speaking on RTÉ's Morning Ireland, the minister said the front of the card contains a photograph, signature, PPS number and expiry date. She said the chips on the cards contain "the standard identity set that we've always used in the department, and that's being rolled out between all departments, which is your date of birth, place of birth, gender, nationality, and if you have a former surname". She said "all of that information is encrypted and no one can read that information from the card". She said the purpose of the card is to ensure that once you go through the SAFE (Standard Authentication Framework Environment) registration process, you will not have to do it again. She said nearly three million people have a PSC. She said the department does not hold the data identifying those who have had their benefits cut because they have refused to register for a card. Solicitor and data protection expert Simon McGarr yesterday expressed concerns over the introduction of the PSC. Also speaking on Morning Ireland, he said there does not appear to be a lawful basis to make it a compulsory requirement, but compulsion is being levied on individuals to force them to get it. Ms Doherty last week said that having a PSC is mandatory to access certain public services. How the legislative provisions set out in the relevant Social Welfare Acts, which have been cited to the Data Protection Commissioner as the legal basis for the PSC, provide a robust legal basis for what is now being implemented across the public sector, beyond public services provided by the Department of Social Protection? How is data collected as part of the issuing of a PSC secured? How does the Safe 2 identity verification process interface with the Single Customer View & MyGovID? How it will interface with the published General Scheme of the Data Sharing and Governance Bill?